Elder is a shrubby, deciduous tree, which grows up to 10 meters high. It is found in hedge rows and open woods throughout the temperate northern hemisphere. It flowers from around May to July and fruits August to October. Both Flowers and fruit are edible, and can be consumed raw. Elder is a traditional cottage garden plant because of its many health giving properties. Seeds contain hydrogen cyanide. It is best to avoid chewing them, as unbroken seeds are more likely to pass through the digestive system. The leaves and bark also contain hydrogen cyanide in larger quantities and should not be consumed. Berries may be mildly toxic when unripe. At any stage, they may be laxative in quantity. The flowers, which form cream coloured umbels, contain rutin, an antioxidant which strengthens capillaries and is said to protect against cancer and heart disease. The flowers are also said to be blood cleansing, and can be used in the treatment of conjunctivitis. They have a peculiar aroma, but make delicious drinks, such as a fizzy "Champaign" (non alcoholic in the early stages), a cordial, wine and tea. They can also be used for making fritters. They can be dried in the sun for storage. Dried produce keeps best in vacuum sealed jars (see my article on haw to use a cheap little wine preserving pump and some sticky tape to turn pickle or jam jars into vacuum sealed containers without heat). The dried flowers do not retain the strong aroma, but are worth keeping for herbal tea. It is also worth leaving plenty of flowers to form into berries for later harvest. The dark purple berries are somewhat bland in taste, but are full of goodness. They are rich in Vitamins A, B and C, and contain an antioxidant - anthocyanin, which improves night vision, circulation and memory. Anthocyanin is a substance often found in red, blue or violet fruit, like blackberries, grapes and mulberries, in red cabbage and even some flowers. Berries can be eaten straight off the tree, used like many other berries for jams, pies, juice etc. or made into syrup to keep as a cold remedy. The berries are also said to be blood and tissue cleansing, anti-rheumatic and diuretic. The juice of the berries can be used for pH testing. It turns green in alkalis and red in acid solution. You can even make your own litmus-type paper. For more information on pH testing, check out this article. The method is not as crude as one might expect. The article also shows you how to make a chart to read the pH level, though it takes a little effort to calibrate it. You probably wonder, what practical use might that have. You could apply it to simple soap making, especially if you make it from basic raw materials from around the home, like wood ash lye. How about trying a very simple liquid laundry soap, which just consists of lye and nothing else? Worth an experiment. However, you need to dilute/adjust it to just the right strength if you don't want your clothes to dissolve. Test a typical washing powder solution for its pH, and match it by adjusting the lye until it gives the same reading. Now, that is where my chemistry knowledge deserts me. Anyone who can comment on whether you can make the lye less alkaline by simply diluting with water, or would you have to add some acid, like vinegar, to adjust it? And how do you store the litmus paper? In a vacuum-sealed jar, of course. A concoction made from the leaves can be used as a plant spray - a fungicide and insecticide, as well as an insect repellant and a green dye with alum. Heat about one litre of the water and dissolve the sugar in it. Add the rest of the water and allow to cool. Add the juice and rind of the lemon (cut the rind into chunks) and the rest of the ingredients. Cover and leave for four days, stirring occasionally. Strain and bottle. Tip: if you put all the non-liquid ingredients into a large herb infuser or one of those rice boiling egg thingies, you don't have to strain them out later. Also, the better you strain it, the better it will keep. Any bits floating around in the drink encourage mold. Ready to drink in about 6-10 days, when it starts to fizz. If you bottle it in glass, open the bottle briefly every day or so to release the built up pressure. For any type of bottle, release the lid very slowly to avoid a fountain shooting up. Store in a cool place. 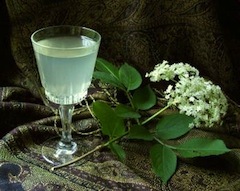 The drink will become less sweet with time, and may even turn slightly alcoholic. If, like me, you adore the taste, it probably won't have the chance. Scald a large container. Boil the water, pour over the sugar and citric acid and stir until dissolved. Allow to cool. Add the juice and rind of the lemon (cut the rind into chunks). Remove flowers from flower heads and add. Cover. Stir 3-4 times a day for two days. Strain (see tip above) into sterilised bottles. Dilute to taste - a nice way is with carbonated water. The cordial will keep for a few weeks in the fridge, and longer with preservatives. If you are not averse to them, you can add Campden tablets according to directions. They are available from brewing suppliers. Tip: to give it a similar flavour to the Champaign, add a little vinegar to taste. It will really perk up the flavour. You can also add ginger to this recipe. This syrup can also be used to make a healthy lactic soda drink. More on that soon. There are still a number of fresh greens available (see March, above), however, the leaves of Ramson/Wild Garlic/Bear Garlic (Allium ursinum), depending on where you live, is coming to an end. Many Nettles (Urtica dioica) are now in flower, and are best avoided when in flower, as they develop cystoliths - crystalline chemicals which irritate the kidneys. On the up side, Wild Strawberries (Fragaria vesca) are now fruiting. Nipplewort (Lapsana communis), a close relative of lettuce, and a relatively late green, can now be found growing. Please read the disclaimer on the Green Spring Bounty page, which applies to this post as well.